In his 2001 album, "Shoulda Been Home", the 5 time Grammy winner Robert Cray, one of the founding fathers of Contemporary Blues almost completely eschews that genre in favor of sweaty retro-style Memphis soul of the Hi and Stax variety. Using the twin tools of his guitar playing and singing, both equally smooth and soulful, Robert Cray helped reinvent the blues, and that’s not only a heavy burden to carry, in many ways it’s a horrible legacy to live down. Not that Cray’s slick, sultry brand of blues has anything more than rudimentarily in common with that particular ilk of soulless, toothless, wankery. It’s just that he’s the Nirvana to their Bush, a great musician who broke through and opened the door for a wave of uninspired and homogenized imitations. Soulful, fiery and funky proof that slick and smooth doesn’t have to be boring and lukewarm and detached. Maybe that’s the reason why Shoulda Been Home finds Cray and his band singing and playing what is basically Blues-tinged Soul music and not the other way around. Or maybe the appeal of that old O.V. Hill, Otis Redding style music was just too irresistible. They certainly didn’t switch up their styles because of a lack of critical acclaim. Each of the Robert Cray Band’s previous 8 albums have been nominated for a Grammy, including 1999’s Take Your Shoes Off, a Grammy winner that also mined the fertile Memphis Soul sound. 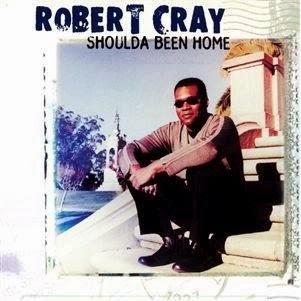 Shoulda Been Home continues that winning formula, with Cray handling the songwriting on about half of the tracks. His originals are strong, holding their own and then some next to Mack Rice and Elmore James classics. That’s right, Elmore James. Cray and co. certainly haven’t abandoned the blues completely. The Chuck Berry-ish version of James’ “Cry For Me Baby” is testament to that, as are many of the scorching yet restrained guitar solos that Cray sprinkles throughout the album. Remember to check out “Baby’s Arms,” a Cray original and the opening track -it’s an upbeat tune featuring an all-star horn section, and it’s soulful, fiery and funky proof that slick and smooth doesn’t have to be boring or lukewarm and detached.If you want a true Blues classic from the early 2000's, look no further!